This page is about a change to British hallmarking in 1907. The Assay of Imported Watch-Cases Act required that from 1 June 1907 all imported gold and silver watch cases to be assayed in a British assay office and, if they passed, to be marked with new specific hallmarks that identified them clearly as imported items, so that no one would think that they had been made in Britain. These hallmarks are called ‘British import hallmarks’. Since at least 1738 the cases of foreign gold and silver watches retailed in Britain should, by law, have been assayed and hallmarked with British hallmarks in exactly the same way as British made gold and silver cases, but the law was misinterpreted by both the customs and assay authorities. It was effectively a choice whether imported gold and silver watches were hallmarked in Britain, and only a very small proportion were, the majority of those between 1874 and 1887 which is explained on the page about Foreign Watches with British Hallmarks. 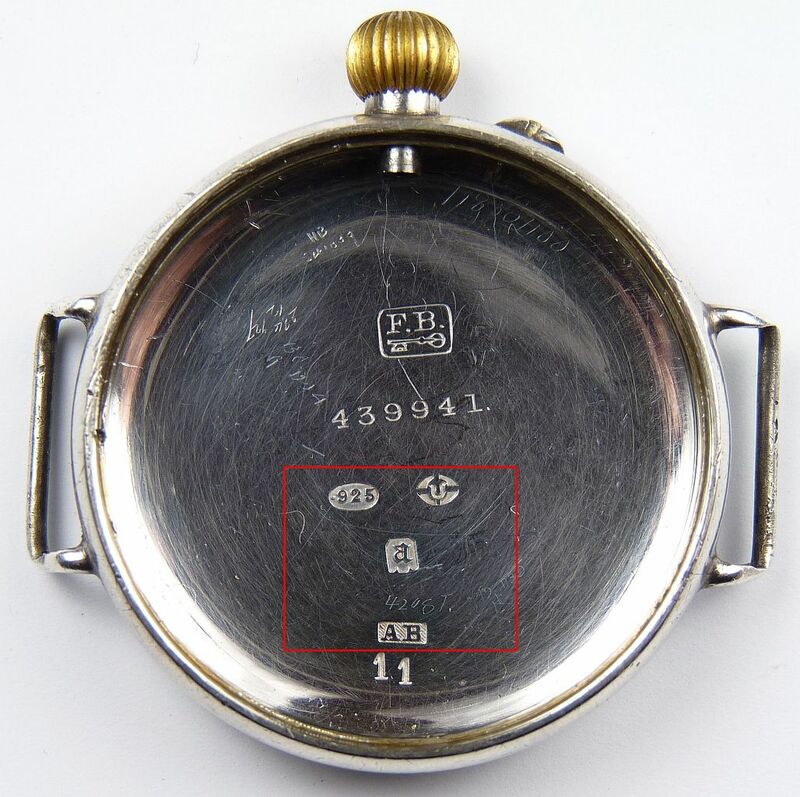 English watch manufacturers objected to any imported watch having British hallmarks, so the Merchandise Marks Act of 1887 specified that from 1 January 1888 onwards new British hallmarks for imported watches with the word ‘Foreign’ across the middle would be applied to any watch cases sent to a British assay office to be hallmarked. 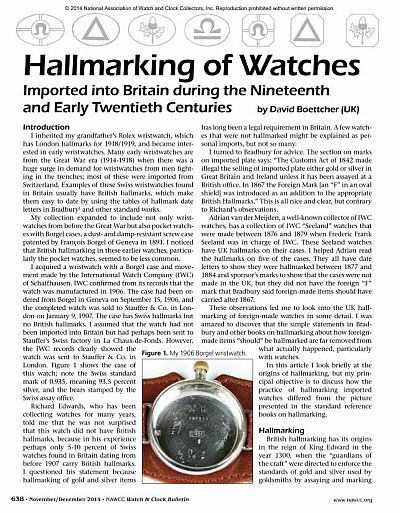 This effectively put a stop to the practice of getting imported gold or silver watch cases hallmarked in Britain, although by law all such cases should have been hallmarked in Britain before being offered for sale. In 1904 an Act introduced new hallmarks for imported gold and silver items other than watch cases, which included new town marks. Some of these town marks were changed in 1906 when they were found to resemble existing trademarks. The 1904 and 1906 laws regarding the hallmarking of imported gold and silver items did not apply to watch cases because the 1887 Merchandise Marks Act that had introduced the hallmarks with "Foreign" across the middle for imported watch cases was not repealed and remained in force. British law regarding the marking of imported watch cases was changed from 1 June 1907 by the ‘Assay of Imported Watch-Cases (Existing Stocks Exemption) Act’, which required that all imported gold and silver watch cases had to be assayed and hallmarked in a British assay office. The 1907 Act brought the hallmarking of watch cases into line with the hallmarking of other imported gold and silver items. 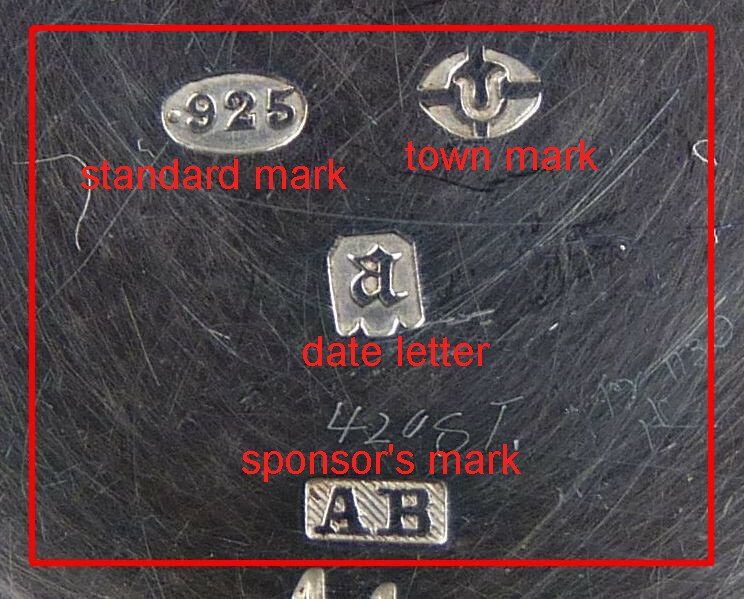 The ‘town mark’ identifies at which assay office an article was tested and hallmarked. From 1906 the town marks used by British assay offices on imported gold and silver items other than watch cases were made different from those used on items that had been made in Britain. This law first applied to imported watch cases from 1 June 1907. Import hallmarks were struck in all imported gold and silver watch cases from 1 June 1907 onwards. This gave rise to an enormous amount of new and extra work for the British assay offices because thousands of watches with gold and silver cases were imported every year. Before 1 June 1907 were simply imported and sold without British hallmarks. The Act also created work for the importers of watches, because cases had to be marked with a British registered sponsor's mark before they could be sent to be assayed and hallmarked. No item would be accepted at an assay office for hallmarking without a sponsor's mark, which showed who was legally responsible for submitting the item. Some large and well organised companies such as Longines sent over cases to be hallmarked and then returned to Switzerland to have movements put in. Other smaller manufacturers found this impractical and so sent over complete watches. The movements had to be taken out of the cases, and the cases punched with the registered sponsor's mark before they were sent for hallmarking. After hallmarking the cases had to be finish polished and re-fitted with their movements. This gave rise to specialists who performed this work for Swiss manufacturers who didn't have an operation in Britain, this is discussed in The Advent of the Assay Agents. One of the principal changes to the British hallmarks struck on imported silver items was that the lion passant, which had been struck on sterling silver since 1544 and was widely recognised and thought by the public to be a mark of British manufacture, was not allowed to be used. Instead imported items were marked with the decimal equivalent of the fineness of sterling silver, 0.925 for 92.5% pure silver, in an oval such as the mark shown here. British made gold items of the higher standards of 22 and 18 carat, and for its brief existence 15 carat, were marked with a crown in addition to the decimal fineness. The crown was omitted on imported items of these standards. The lower standards of 14, 12, and 9 carat gold were only ever hallmarked with the numerical carat value and its decimal equivalent, e.g. "9/.375" for 9 carat gold which is 9 / 24 = 0.375 or 37.5% fine gold. The new law came into effect on 1 June 1907; this is discussed further at the bottom of this page and in my article published in the NAWCC Watch & Clock Bulletin as shown here. Articles in the NAWCC Bulletin are copyright and usually only available to NAWCC members. However, after a request from the the archivist of the Incorporation of Goldsmiths, who looks after the historical records of the Edinburgh and Glasgow Assay Offices, the editor of the NAWCC Bulletin has allowed the article to be made publicly available and it can now be downloaded by clicking on this this link: DOWNLOAD. My research has also been incorporated in the latest version of Bradbury's Book of Hallmarks, you can read about this at Bradbury's Book of Hallmarks. If you want details of British hallmarks used on watch cases before 1907, and which continued to be used on British manufactured watch cases after 1907, please refer to my British Hallmarks page. The The Hallmarking Amendment Act 1998 removed import marks leaving only the traditional town marks such as the leopard for London and the anchor for Birmingham as legal marks, so there could no longer be any distinction made between items made in the UK and those made abroad. The assay offices have taken this as an opportunity to expand their business by marking items made outside the UK with the traditional British hallmarks, and some have even opened offices abroad. Sheffield were the first assay office to mark offshore in Italy using the Rose town mark. The London and Edinburgh assay offices hallmark at Heathrow products shipped off planes while they rest in customs. The Birmingham Assay Office now hallmarks items in India using the anchor. The assay master of the Birmingham Assay Office told me "At a conservative estimate we have marked 50 million imported articles with anchor hallmarks since 1999." Most of the early wristwatches that I am interested in were imported after June 1907, simply because there were very few men's wristwatches made before 1907. The picture here shows the inside case back of a silver wristwatch imported in 1916 or 1917 with typical British import hallmarks. The principal differences between these and hallmarks on a British made silver item is that the town mark of the assay office is one of the new town marks, and the standard of fineness is indicated by the decimal equivalent of sterling silver, .925, instead of the lion passant. The British import hallmarks are inside the red box. If you click on the image a larger version will pop up. Marks on imported gold cases are very similar to marks in this silver case. The new town mark indicates the assay office, and the standard of fineness is given as the decimal equivalent of the legal gold standards. The crown that was used on 22 and 18 carat gold British items was not struck on imported items. The date letters for gold items have a different shaped shield to those on silver items, as discussed below. The standard mark showing the fineness of the metal, in this case .925 for sterling silver. The town mark showing where the article was assayed and hallmarked, in this case the zodiac sign of Leo used by the London Assay Office on imported items. A date letter showing when it was hallmarked, in this case the "a" of 1916 to 1917. Because the date letter punches were changed when new wardens were elected each year, which took place part way through the year, hallmark date letters span two calendar years. This is not noted in most tables of hallmarks, which only show the year when the punch was first used. Please remember that an entry of, for example, "1914" really means 1914 to 1915. A sponsor's mark showing under whose name an item was submitted for hallmarking, in this case the initials "AB" in a rectangular shield with cut corners, the registered mark of Arthur Baume. These four marks are discussed in more detail below. All four of these marks must be present in a valid and legal British hallmark. The serial number and the case maker's trademark, if there is one, were applied in Switzerland. Unfortunately many watch cases don't have a maker's trademark, just an anonymous serial number. In this case we are lucky and the case has the mark of François Borgel. If the case was made after about 1924 and is made of gold or platinum, then there will also be an encrypted mark registered by its maker. 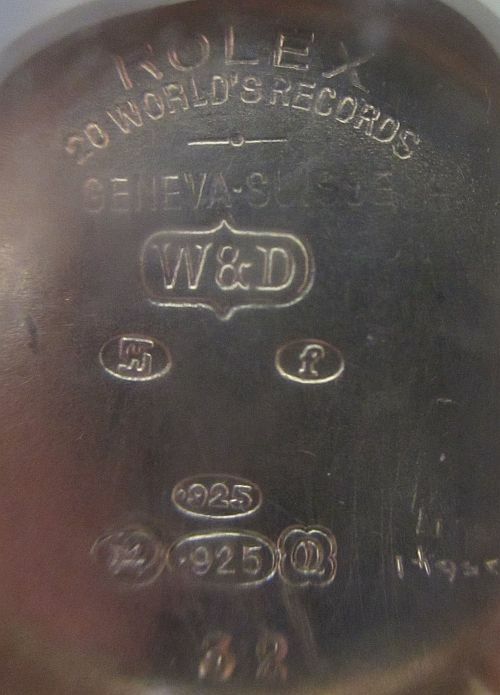 See the section on Swiss hallmarks and Poinçons de Maître on the page about Swiss Hallmarks. Unfortunately the Swiss didn't consider silver to be a precious metal so Swiss silver watch cases are not marked with Poinçons de Maître. There may also be additional marks from the country of origin such as a bear rampant (standing on his back legs), and 0.935 (a Swiss standard for silver purity) which you can see in the case back of my grandfather's Rolex on my Rolex page. A Swiss law which came in to force in 1880 required that items made from precious metals should be tested and have Swiss hallmarks, and these are seen on items imported between 1880 and 1907. Most imported gold and silver watches after 1907 have only the British hallmarks. It appears that once the law requiring imported watches to have UK hallmarks was enforced, the Swiss makers stopped submitting them for Swiss hallmarking. There was no sense in paying to have items hallmarked twice. One of the principal changes to the hallmarks struck on imported silver items was that the lion passant, which had been struck on English sterling silver since 1544 and was widely recognised and thought by the public to be a mark showing English manufacture, was not struck on imported silver items. The crown mark used on the higher standards of English gold items was similarly not struck on imported gold items. Imported silver items were marked with the decimal equivalent of the legal fineness in an oval such as the mark shown here. The decimal .925 was used instead of the lion passant on sterling silver, the decimal .9584 instead of the figure of Britannia for the higher "new" standard of Britannia silver. I have never seen this on a watch case and I doubt that any imported watch cases were made of Britannia fineness silver. For imported gold items the marks show the carats and decimal equivalent, as shown here for 9 carat gold. The decimal equivalent of the purity is found by dividing the carats by 24, so for 9 carat the decimal equivalent is 9/24 = 0.375, which is 37.5% gold. From 1854 the gold standards allowed were 22 carats (.916), 18 (.75), 15 (.625), 12 (.5) and 9 (.375). The Dublin Assay Office only was authorised to also mark 20 carat (.833) gold. In 1932 the standards of 15 and 12 were replaced by a single standard of 14 (.585) carats, the others standards remaining. To send an item to an assay office to be assayed, a person must first be registered with that particular office. The reason for this is pretty obvious - the office needs to know who to invoice for their services and who to return the items to. To facilitate this, the Assay Office requires that each registered person have a registered mark which is unique to them. This usually consists of the persons initials set in a "shield", a surrounding shape. Items have to be stamped with a sponsor's punch mark before they are even assayed, let alone hallmarked. It has been the law and practice since 1363 (the year 1363 that is, over 650 years ago) that an item will not be hallmarked unless it already bears the sponsor's mark. Today the assay office will hold your punch and stamp items for you if you wish. This is what I do. If the items fail assay they would still charge for punching the marks, but fortunately I have never encountered this, I buy my silver and gold from a reliable bullion dealer. This mark is sometimes erroneously called the "maker's mark", but this is very misleading at the best of times and of course for an imported watch case it is completely wrong. The term "sponsor's mark" should always be used for this mark. If a person wishing to register a mark has the same initials as someone already registered, the shield of their mark will be different so that the two marks can be distinguished. The registered sponsor's mark is punched on to each item before it is sent for assay and hallmarking. If more than one punch is needed, because the are a lot of items to be marked, or because one wears out, then each individual punch must be registered. The sponsor's mark is the registered mark of the person with a British address under whose name an item was submitted for hallmarking. On a Swiss made watch case there may also be the Swiss maker's mark, but a Swiss based sponsor would not be acceptable to a British assay office and therefore the sponsor must have a British address. You can look up details of sponsor's marks on my Sponsor's Marks page. The year denoted by the so called "date letter" can be confusing because until the 1973 act, the hallmarking year did not run from 1 January. This mark was introduced in 1478 and was at first called the "assayer's mark" as a record of who was responsible for the assay. It was changed each year when new wardens were elected, which in London was at the end of May, so an item marked with an "a", which the table in Bradbury indicates is the date letter for 1916, could have been marked at any time from 29 May 1916 to 28 May 1917, or possibly even some time in June if the punches were delivered late as sometimes happened. Each assay office had its own sequence of letters, which was different from all the other assay offices, depending on when the office first opened for business. The Glasgow hallmarking year ran from 1 July to 30 June the next year, evenly spanning two calendar years. The Glasgow office closed in 1964. The Birmingham office also changed its date letter with the annual election of the wardens on 1 July. Because the date letter punches were changed when new wardens were elected each year, which took place part way through the year, hallmark date letters span two calendar years. This is not noted in most tables of hallmarks, which only show the year when the punch was first used. Remember that an entry of, for example, "1914" really means 1914 to 1915. See also the sections below about Shield Shapes for Import Hallmarks and Cautions about using Tables of Hallmarks. Sometimes watch cases are seen with hallmarks from a British mainland assay office, and a second set of hallmarks from the Dublin Assay Office. 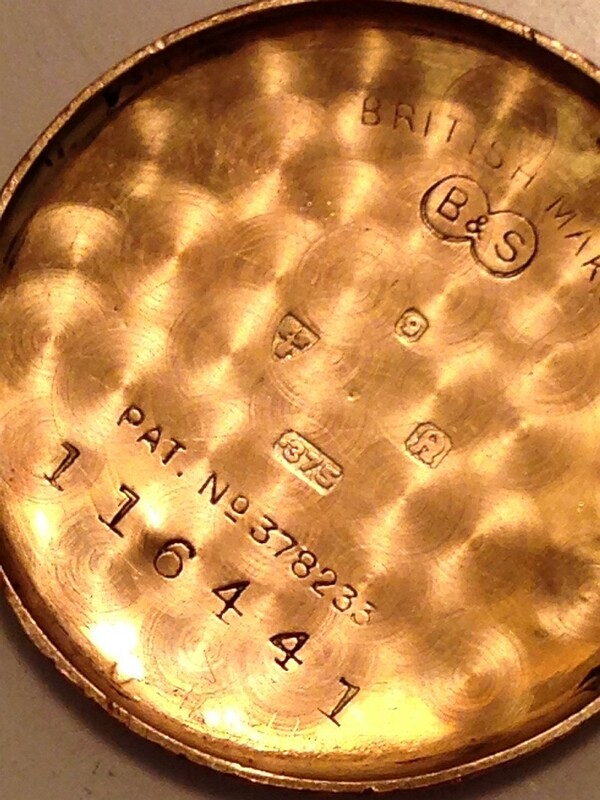 The British hallmarks were struck first, the Dublin marks later when the watch was imported into Ireland. Before 1922 all of Ireland was part of the United Kingdom, and hallmarks struck in any UK assay office were valid throughout the realm. In 1922 the Irish Free State separated from the United Kingdom and formed the republic of Ireland. As a result of this separation, Irish hallmarks were not accepted in the UK after 1923, and UK hallmarks were not accepted in Ireland after 1927. Because of this, watches imported into Britain and hallmarked in Britain, if sent to Ireland, were then also assayed and hallmarked in Dublin. This was confirmed to me in 2013 by Mr Le Bas, Assay Master at the Dublin Assay Office. This happened more than you might think at first sight, because many Swiss manufacturers and watch importers had offices in London, and held stocks of hallmarked watches in England. If a retailer in Ireland ordered a watch, it was sent from England and assayed and assayed and hallmarked again in Dublin before sale, so one watches with both British and Irish hallmarks are not too unusual. An example of a Rolex case marked this way can be seen in the Rolex case with Glasgow and Dublin hallmarks is shown here. The Glasgow Assay Office import hallmark for sterling silver have the date letter "f" for the year 1928 to 1929. The Dublin hallmark has the date letter "Q" for the year 1932 to 1933. These dates were during the great depression and it is evident that the watch hallmarked and then kept in stock in London for several years before it was sent to Dublin and hallmarked for a second time. Marks such as a sponsor's mark or the walking ‘lion passant’ are usually rendered in "cameo" or "relief". To make the mark the metal around the letter or shape is pressed down by a punch and the letter or shape itself remains at the original surface level, standing out in relief against the metal that has been pressed down. The shape formed by the nose of the punch as an outline around the mark is called the "shield", or sometimes the "escutcheon". 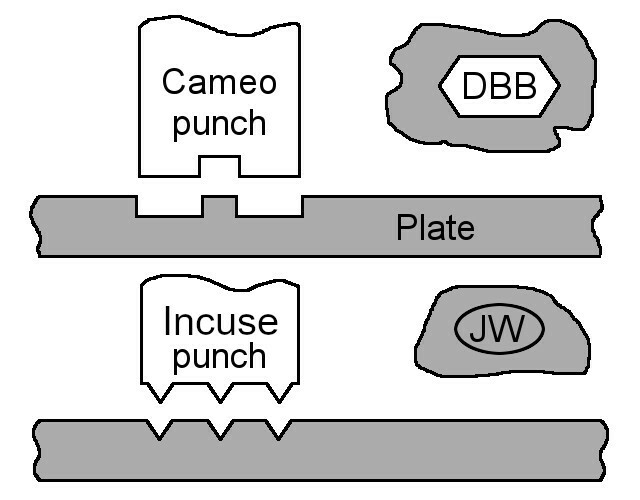 An alternative form of punching is called "intaglio" or "incuse". The shape of a letter or mark is simply pressed or cut into the surface of the metal. This type of mark often has no shield, although sometimes the punch also presses or cuts a shield around the letters or mark. The sketch here shows the two types of punches for stamping two different styles of sponsor's marks. The cameo punch is cut away so that the initials are created in relief (cameo) by pressing down the metal around them. The outside shape of the nose of the punch forms the shield around the initials. This is called a cameo mark. The intaglio or incuse punch presses the shape of the initials into the metal. Sometimes a shield is also made, as shown in the picture, which is also pressed into the metal. This is called an incuse mark. The shield shapes around cameo marks, and around incuse marks if they have them, are an important part of the mark. This applies to all the marks, but is especially important for date letters and sponsor's marks where there are lots of basically similar marks that must all be unique. For instance, when I registered my sponsor's mark at the London Assay Office I found that someone with the same initials, DBB, had already registered their mark with a rectangular shield, so I chose to have a shield with angular ends as shown in the picture, which makes this mark unique to me. Faint marks that are difficult to read are described as blurred or "rubbed". This is often thought to be the result of years of polishing, but the most substantial rubbing took place as the case was being finished after hallmarking. The punching of hallmarks at the assay office often caused considerable distortion to the case and so, after hallmarking, watch cases needed "rectification" to straighten out distortions caused by the punch and polish out any scratches. If the polisher was not paying attention or left the work on the rotating buff for a little too long, a punch mark in gold or silver, which are relatively soft, is easily rubbed or blurred. Anyone who works with silver or gold knows this from experience. Sometimes the marks were none too clear when they were stamped. The punches used to stamp the marks wore down a little bit each time they were used, and eventually the mark they made was nothing like as crisp as when the punch was new. Because punches were expensive they continued to be used until they had worn down to the point at which the mark was no longer clear. The shields around date letters are maintained for one cycle of date letters, i.e. A to U for the London Assay Office or A to Z for most of the other offices. For the next cycle the case and the font face of the letter is changed, for example from upper case sans-serif letters to lower case serif letters. The shield shape is also changed for each cycle to make it even more unique. Different shield shapes were also used for the date letters on gold and silver. This often causes confusion because often only the shield shapes for date letters used on silver are shown in most reference books. These is more about this below. The shape of the shield of a sponsor's mark is very important because it is part of what makes each sponsor's mark unique. A sponsor's mark is a compulsory component of the hallmark and comprises the initials of the sponsor's personal or company name surrounded by a shield to form a unique mark. All sponsors' marks are unique and once allocated will never be re-issued to anyone else. When I wanted to register my sponsors mark I found that there was already a mark registered with my DBB initials. By choosing a shield shape with angled ends as shown in the picture, I was able to create a sponsor's mark that was unique to me. Bear this in mind when you are looking at a sponsor's mark, the shield shape is just as important as the letters. The shields or surrounds around the date letters of British import hallmarks were often oval. This means that they are different from the shields around date letters of native manufactured silver items, which are the ones that are illustrated in reference books such as Bradbury's. The Glasgow and Chester Assay Offices seem to have been consistent in this practice. 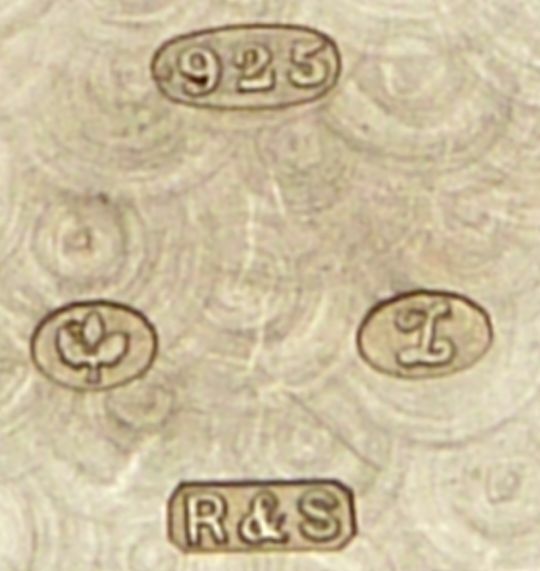 I have seen import hallmarks from the Birmingham Assay Office that also have oval shields around the date letters, but I am not sure this was consistently followed. 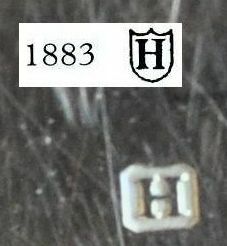 The picture here shows a Glasgow "u" for the hallmarking year 1917 to 1918 in an oval shield in an imported silver watch case, together with a picture of the same date letter "u" from Bradbury, showing how it would appear on a native UK manufactured silver item, in a square shield with a curly base. The picture below of a Chester "Z" also shows an oval around the date letter, whereas Bradbury shows that a square shield with a curly base would be used on UK manufactured items. Rather strangely, Glasgow didn't use an oval shield around the date letter of imported gold items, using the same shaped shield for the date letters of both imported and native gold items. I am not sure what the other assay offices did in this regard. The other assay offices used the same date letter shields for both native and imported wares, with different shields being used for silver and gold as noted above. Note that the assay offices started their cycles of assayer's marks (date letter) in the year they were founded, so they are all different. The table below shows examples the different assayer's marks for imported items from 1 June 1907* for the offices most commonly encountered on imported watches, and some date letters which should also give you a stab at a date. The date letters used by the London and Birmingham assay offices are quite easy to read, standard lower case serified letters pretty much as I have shown. But some of the Glasgow and Chester offices' letter forms from this period are so outrageous that you need to look in one of the standard references to have a chance of reading them. The picture here shows one mark that I struggled with; it is a Chester mark on sterling silver with the sponsor's mark for Rotherham & Sons. The date letter is actually the "Z" of the hallmarking year 1925 to 1926, but a mark that looks less like the letter Z would be difficult to imagine. Because the date letter punches were changed when new wardens were elected each year, which took place part way through the year, hallmark date letters span two calendar years. This is not noted in most tables of hallmarks, which only show the year when the punch was first used. Please remember that an entry of, for example, "1914" really means 1914 to 1915. The "Import Marks", the special town marks pictured here that were struck on imported watches instead of the usual assay office marks, came into use by Order in Council and Customs Declaration on 1 June 1907 and not before. If you think you have a watch with one of these marks dated earlier than 1907 you are mistaken - You can read the full explanation of this on my Hallmarks page. See also note 3 for why date letters are sometimes confused. British assay offices changed their date letter punches when new wardens were elected, part way through the calendar year. At the London Assay Office this was at the end of May, for most other offices it was the beginning of July. This is why hallmark date letters only pin down the date of hallmarking to a two year period. Because of limitations of web font faces I can't accurately reproduce the font faces used for the letters. Until 1915 London used lower case date letter with serifs, from 1916 lower case Gothic. The Glasgow and Chester date letters covered by the table are all upper case in a flowing script that is hard to read. The Birmingham date letters covered by the table are all lower case with serifs. There are not enough letters in the alphabet to cover the 600 years plus that date letters have been struck, so they have to be used repeatedly with difference between the styles of letter in different cycles. The letters I have listed above cover the dates of the watches I am most interested in. However, if you have bought, found or inherited a watch it may well not fall into this date range, so don't just read the London letter "s" and assume that your watch is dated 1913/1914, it might well be 1933/1934 when the letter s was used again, this time in Gothic rather than plain. If you have any doubts, do just drop me an email, ideally with a picture of the watch, the movement and the hallmarks. Before 1738 specific requirements for hallmarking foreign items had not developed because there were very few such items in circulation. An Act of 1738 required that all items of silver or gold that were traded or "exposed for sale" must be hallmarked; by implication this included foreign made wares. An Act of 1842 stated explicitly that all imported silver and gold items must be hallmarked. An Act of 1867 required that a letter "F" be struck alongside the hallmarks to indicate that the that item was not made in the UK. Each Assay Office has its own "town" mark to show at which office an item was assayed. Amongst the most familiar of these are the leopard's head for London, the anchor for Birmingham, the upright sword between three wheatsheaves (garbs) for Chester, etc. An Act of 1887 required that after 1 January 1888 the marks struck on foreign watch cases were to be completely different from the normal UK hallmarks, so that they couldn't be mistaken for UK manufactured watch cases. New town marks were stipulated for use on foreign watch cases as part of a single compound punched mark containing the town mark, the standard mark and the date letter all inside a single cross (for silver) or octagonal (for gold) shield with the word "foreign" prominently across the middle. The marks to be used by the London Assay Office are shown in the picture to the right, other offices had similar marks with their own town letter where the sun symbol is in the London mark. As I explain on my Assay and Hallmarking page, the use of these compound marks is more than extremely rare, it is virtually unknown; I have never seen one, and I don't know anyone who has. If you ever see one of these marks, please let me know! However, due to a massive misunderstanding of the law by the UK Board of Customs and the Assay Offices, these legal requirements were not properly implemented until 1 June 1907, and Swiss watches with UK hallmarks (either normal UK hallmarks, with or without the letter "F", or the special import marks introduced for watch cases in 1887) before that date are rare. The 1887 marks (shown at 1887 Merchandise Marks Act are so rare that there may be no watches still in existence carrying them; if you find one, please do let me know. In 1907 an Act, the "Assay of Imported Watch-Cases (Existing Stocks Exemption) Act 1907" was passed to exempt all watch cases imported into the UK before 1 June 1907 from hallmarking, but requiring that all watches imported after 1 June 1907 be correctly hallmarked. As a result of this there was a sudden and huge increase in workload at the assay offices. You can read the full sorry tale of this 169 year long run of misunderstanding on my Hallmarks page. This change in the law in 1907, or rather the official implementation of the existing law, was the reason the major importing agents Arthur George Rendell (AGR) of Robert Pringle & Sons (one of the UK's largest wholesalers of jewellery, silverware and watches), and George Stockwell (GS) (one of the UK's biggest carriers and import agencies) registered sponsor's marks for the first time at the London Assay Office in 1907, Stockwell on 15 June 1907 and Rendell on 25 June 1907. These assay agents and many others registered their sponsor's marks so that they could organise the hallmarking of imported watches. You can look up details of Rendell, Pringle, Stockwell and other sponsor's and maker's marks on my Sponsor's and Maker's Marks page. After 1 June 1907 all imported watch cases have the new town marks struck on their own in the usual fashion for hallmarks, that is not part of a composite mark but struck separately from the standard and date letters. The symbols defined in 1888 for watch cases had never been used until in 1904 they began to be stamped on imported gold and silver items other than watch cases. This brought to light problems with some of them the symbols, such as the sign of Phoebus (a radiant sun's head) that had been defined for London. To overcome this new town marks were defined in 1906 for London, Dublin, Glasgow and Sheffield. The marks shown in reference books as being in use by these assay offices between 1904 and 1906 were never used for watch cases. Before the Great War (1914 - 1918) London was used by many Swiss companies as the route by which they could access the large market of the British Empire, through subsidiaries or branch offices in London with English speaking staff. In 1915, to conserve foreign currency reserves as part of the war effort, the British Government imposed an ad valorem duty of 33⅓% on imported luxuries, including clocks and watches. This meant that any watches imported into London, even if only for checking with subsequent export abroad, would be subject to this new high rate of tax. The new tax had a major effect on the import of Swiss watches in gold cases. The high cost of gold meant that a large part of the cost of a gold watch was due to the cost of the metal in its case, which is also why so many gold watches have been stripped of their cases over the centuries. Because of this high rate of tax, many Swiss companies switched to importing bare movements into Britain and having them put into gold cases by English companies such as the Dennison Watch Case Co..
To avoid paying import duties on watches that were not destined for sale in Britain, many Swiss companies started exporting them directly from Switzerland to British colonies and overseas territories, bypassing Britain and the British import tax. One of the companies that was affected was the Rolex watch company, which before the war was entirely based in London. As a result of the import tax, Hans Wilsdorf at first set up an office in Switzerland, and then later moved the Rolex headquarters and main operations there. If it hadn't been for that tax, Rolex today might still be a British Company! Silver watches were not so affected by the tax because the cost of the case made up a much smaller proportion of the total cost of the watch, so it was not worthwhile getting them cased in Britain. Silver Swiss watches continued to be imported in Swiss made silver cases for sale in Britain throughout the war and the period of the higher tax. I am not sure when this tax was discontinued, but the case back in the picture here suggests that it started a trend for importing bare Swiss watch movements and putting them into British made gold cases that continued long after the Great War had ended. The hallmarks in this case are Chester Assay Office marks for a British made item. The town mark is the triangular shield with three wheatsheaves around an upright sword, the traditional town mark of the Chester Assay Office. After 1 June 1907 this was only used on watchcases actually made in Britain, it was not used on imported watch cases hallmarked at Chester, they got the town import mark instead. The standard mark is the crown and ".375" of nine carat gold, the date letter is the "N" in "Court hand" script of 1938 to 1939. The sponsor's mark B & S was entered by B H Britton & Sons, the punch that made this mark was registered in May 1931. The patent number seen in the case, 378233, for "Improvements in watch cases" was granted to Charles Henry Britton, Walter Britton and Herbert Britton of 35 Hockley Hill, Birmingham, on 11 August 1932 with a priority date of 15 September 1931. The object of the invention was to provide an improved construction of a two piece watch case with a neat and attractive appearance that could be cheaply manufactured. The case was made from a short piece of tube that formed the middle part of the case. This was pressed or rolled at both ends to provide the recess for the glass at the front and an undercut at the rear for the case back to snap on to. The watch that the case back is from has an anonymous Swiss movement. Taken together with the patent this suggests to me that rather than a Swiss manufacturer sending watches to be cased to avoid duty, Britton & Sons were buying in movements on their own initiative from one of the Swiss ébauche factories and casing them, possibly having got into this during the Great War as a result of the high duty on imports. When you first pick up a book of hallmarks such as Bradbury's Book of Hallmarks, you might think that it is easy to use the tables to discover all that you need to know about a hallmark. Although these books are good summaries, hallmarking has a very long history and can be surprisingly complicated. Here are a few things you need to be cautious about. Each assay office used its own cycles of date letters, which depended on when the office was set up and the date on which the wardens were elected, which is also when the date punches were changed. Because of this, date letter tables are unique to each assay office. You cannot use a date letter from one assay office to read a hallmark struck by a different office. Most date letter tables give only the year in which the punch was first used. Punches were changed when new wardens were elected, which was usually in May or June, so same punch was used over a period spanning two calendar years. For instance the "a" used first used by the London Assay Office in 1916 shows only that the item was marked in 1916 or 1917. From the restoration of Charles II in 1660 until 1973 the London Assay Office hallmarking year ran from 29 May to 28 May the following year. I doubt that you will be looking at gold or silver from before the restoration, but then it was 19 May, the Feast Day of Saint Dunstan. The Chester Assay Office hallmarking year ran from 1st July to 30th June, neatly bisecting the the year. The Chester Assay Office closed in August 1962. The Glasgow hallmarking year ran from 1st July to 30th June. The Glasgow Assay Office closed in 1964. The Birmingham Assay Office office also changed its date letter with the annual election of the wardens on 1st July. The picture here has superimposed at the top the entry from Bradbury of the London date letter "H" for 1883 to 1884. It also shows an "H" date letter mark on an 18 carat gold watch case for the same hallmarking year 1883 to 1884. But the shape surrounding the letter is different, so how can it be the same year? The reason is that different shield shapes were used on silver and gold, but most reference books show only the marks used on silver. The date letter in this 18 carat gold watch case is rectangular, which is the shape used by the London Assay Office on the "higher standards" of 18 and 22 carat gold for date letter cycle XXI. The shields around date letters marked by the London Assay Office on the "lower standards" of 15, 12 and 9 carat gold during this cycle were round. Why do most books only show the marks on silver? Most collectors of hallmarked plate collect silver, for the simple reason that items made from gold such as plates, spoons and cream jugs are virtually non-existent and extremely expensive. I expect that the only person who has a collection of gold plate is Her Majesty the Queen, and I doubt that she needs to consult a book to know about it. Watches and wedding rings are the only gold items most people will ever own or handle, and tables do not usually reproduce the date letters found on them. 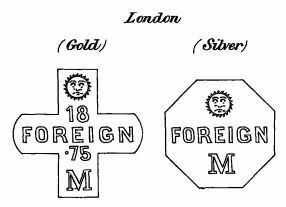 There is only one book that I am aware of, Jackson's Silver and Gold Marks, that shows the London Assay Office date shield shapes for the higher and lower standards of gold in addition to those for silver for each cycle of date letters. Why did Jackson choose to list the different shield shape marks for date letters on all the standards of gold and silver? Well, he was very thorough, and his book is regarded as the bible of silver collecting as a result. There is a reasonably priced pocket version available that shows the different shapes of most date gold and silver letter shields. But note: only for London hallmarks. Even Jackson's doesn't show all of the variations in the punch marks. Punches were made in various sizes, and those for watch cases were at the smallest end of the range. The marks were combined in a single "press punch" so that they were all struck in one go using a fly press. The shields around the marks on the press punches used on watch cases were often different to those used on larger pieces of plate of the same metal. For instance, on silver instead of the base of the shield around the date letter having a small point it was rounded. This was likely because of the difficulty of making the point on a small punch, but might have been done to get even striking. Some Birmingham town mark and date letter shields for silver are also not the same shape as shown in the published tables but instead are triangular with a point at the base, and sometimes cut top corners. The Birmingham Assay Office told me that the outline around hallmarks for watch cases are not shown in Bradbury and that the marks shown are those used for silver wares and that watch cases often have different shield shapes. However, I have at least one example of Birmingham hallmarks with the "k" of 1909/1910 that does have the same shield shapes as shown in Bradbury, so I think this was principally a nineteenth century practice.